It was a match that had it all with fight shown by both players. ground strokes to hit full momentum in the super tie-breaker. "I just had to keep moving myself around and not get stiff," Thomas said of his approach in the second set. "I started to hit the ball better and just my serving has improved in the last two years as well." The youngsters traded quality shots with left-handed Lachlan's penetrative shots a feature. Thomas seemed to have all the momentum in the tense super tie-breaker when he produced a perfectly-placed lob to have Lachlan scrambling. From the 2-2 score in the tie-breaker Thomas won four of the next five points to lead 6-3. 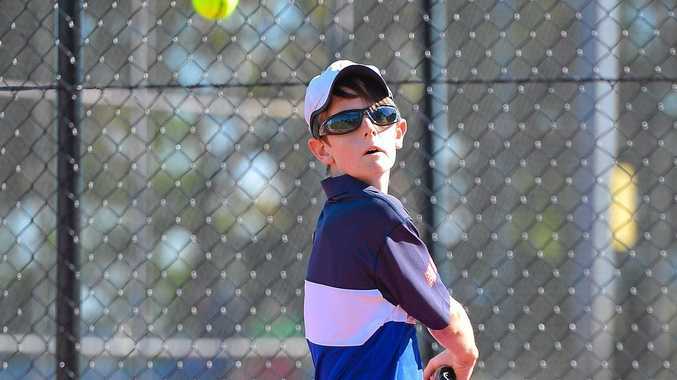 Both players served successive double faults before a sizzling rally had Lachlan edging to within a point. He then nailed a brilliant forehand cross followed by a 'come-on' yell and scores were locked away. Lachlan then went to the net to be one-point away from glory after a sensational rally. He then put away the match-winning forehand. While Thomas was pleased with how he played, he did say that there were some crucial things to work on. Because in all sport, athletes learn more from losing than in winning. "I got a bit tentative and did not hit the ball deep enough," Thomas said. "Lachlan hit them deeper and that allowed him to attack the net." The left hander said keeping calm was key in his super tie-breaker comeback and also suggested he tried to play 'too cute' in the second set. "Well, just getting the ball back and just to try and take deep breaths," Lachlan said of what he tried to do during the super tie-breaker. "I tried to go too close to the lines during the second set, but the most pleasing thing was to stay focussed and also to smash away the winner." Meanwhile Gladstone's Nathan Cook went down to Kyle Johnston in the under 17 boy's final. Biloela's Lydia Coulthurst defeated Bundaberg's Briannah McNab 6-1 in the under 15 girl's final.